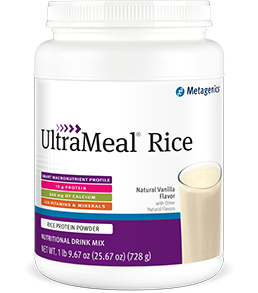 UltraMeal RICE is a tasty, non-dairy, nutritionally fortified, powdered meal replacement for those who want to support healthy body composition but may be sensitive to soy. The rice protein in UltraMeal RICE is provided via a patented process that ensures consistent quality, and is suitable for modified dietary elimination programs. Offers a comprehensive, healthy source of foundation nutrition with all essential vitamins and minerals. Ensures a high-quality source of vegetable (rice) protein. Comes with a Quick-Start Guide and a more comprehensive Patient Guide for complete program guidelines. Available in delicious Natural Chocolate and Natural Vanilla. Blend, shake or briskly stir about 2 level scoops (52 grams) of UltraMeal RICE into 8 fluid ounces of chilled water twice daily, or as directed by your healthcare practitioner.